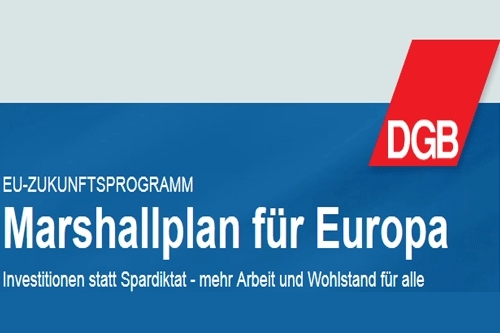 The DGB’s ‘Marshall Plan for Europe’ is a first attempt by one of the leading bodies of the European workers’ movement to provide a working class pan-European response to the crisis. It implicitly rejects all the crude stereotyping that has been repeatedly used to divide the workers and oppressed of Europe along national, ethnic, religious and other reactionary lines. Instead, it explicitly calls for a 10-year pan-European investment programme to include all 27 EU economies. The report notes that, ‘those countries currently in financial crisis will not be able to implement a modernisation initiative like this one on their own. This is why we need joint efforts and new European institutions with stable and solid sources of financing”. The Plan calls for an annual level of investment of €260bn in the development of major cities, transport, infrastructure, broadband and education. It estimates that this would create 9 to 11 million new jobs. There is a particular focus on investment in renewable energy production and the reduction of CO2 emissions. There is an aspiration to cut CO2 emissions by as much as 80% to 95% from the 1990 level by the year 2050 through investment, in addition to implementing the plan to cut emissions by 20% by 2020, and this forms the majority of the investment programme. The Plan also rejects any notion that new investment must be ‘paid for’ by further austerity measures. Instead, it proposes a 3% wealth tax to start a European Future Fund, with new bonds paid for by the imposition of a Financial Transactions Tax. This seems an overly complex proposal, not least as the authors note that European companies are sitting on enormous cash balances (held in the banks) which they refuse to invest. There is clearly some contradiction too between looking to curb the excesses of financial speculation and building revenues on taxes from it into plans for investment. But this is a discussion to develop within the movement among all those who accept its main aims. The DGB explicitly calls for a debate across Europe on its proposals, which the workers’ movement should take up. Discussion should focus on any improvements to the Plan and how to champion it politically. The ruling classes have utterly failed with their economic policies and increasingly attack one scapegoat after another to divert attention from that failure. The DGB’s ‘Marshall Plan’ represents a serious attempt to offer an internationalist, working-class solution to the crisis and should be promoted widely for discussion and action.